The NYC Marathon officials have the wheelchair entrants begin before the thundering herds of runners spring forth. By the time the first wheel chair contestant races up First Avenue on the Upper East Side of Manhattan, he or she (but usually “he”) is already well past the halfway point. Halfway is in Long Island City, a part of Queens, one of the five boroughs that comprise New York City. Early on, and, I suspect, the farther you are from the race’s start, there can be long lag times between cheering on the first contestant and waiting for the next. In the circle, the two female frontrunners, Buzunesh Deba and Priscah Jeptoo. But it’s worth the wait. 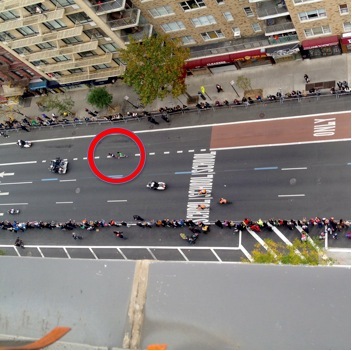 In the red circle, above, are the two female front runners, Buzunesh Deba and Priscah Jeptoo. You could see that clearly from on high, right? There is a great band playing between 80th and 81st Streets, and this is a sonic backdrop to the rise and falls of cheers as each runner passes. Eventually, great masses of people – folks who run for the love of it, or for personal challenge, or in honor of someone, but no longer for prize money or their names in the headlines – thunder by. In a marathon, there is always the clash of hope and despair, training and surprise, stumbling and triumph. Our last two marathons – New York’s in 2012 (cancelled due to Hurricane Sandy) and Boston’s in 2013 (the bombing) – were enmeshed in tragedy. 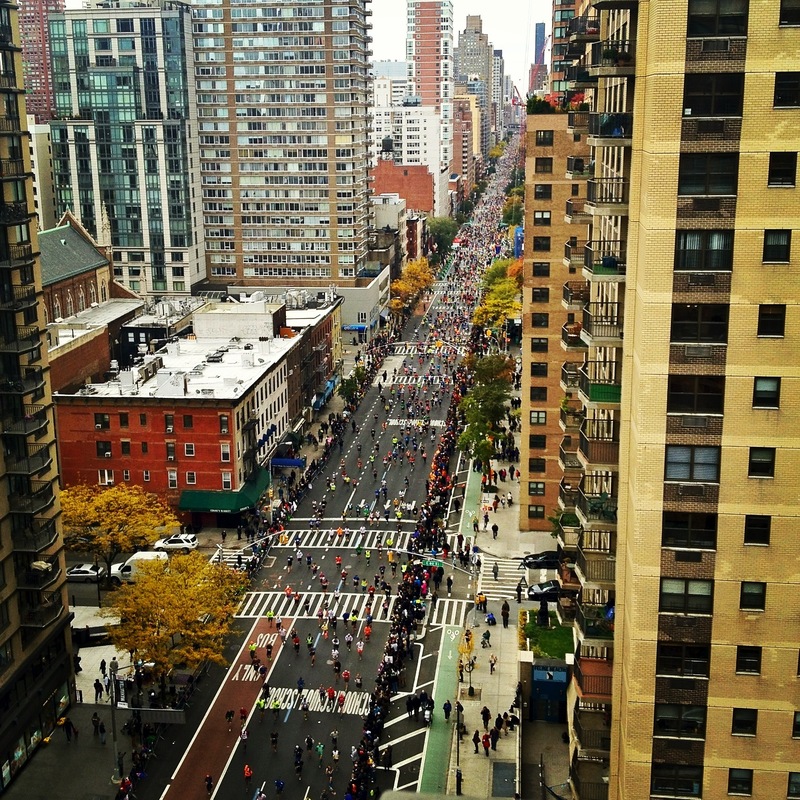 Whether we participate by running or by watching, we can’t help look over our collective shoulder to what went before…. There are metaphors to give us strength and lessons to be learned. The City said that they beefed up security – not that this is intrusively apparent. Well done, City. After most of the runners are long gone, kids and parents play ball in the traffic-empty streets. For a while. Until just after dark. It is a beautiful day of anticipation and celebration.